Eltronicschool. - There are many circuit schematic designed using temperature sensor LM35 for many application now. Using LM35 sensor, user can detect the temperature change in environment selectively step by step. To use this sensor, you must know special circuit schematic that can result this sensor when they interface with Arduino UNO. 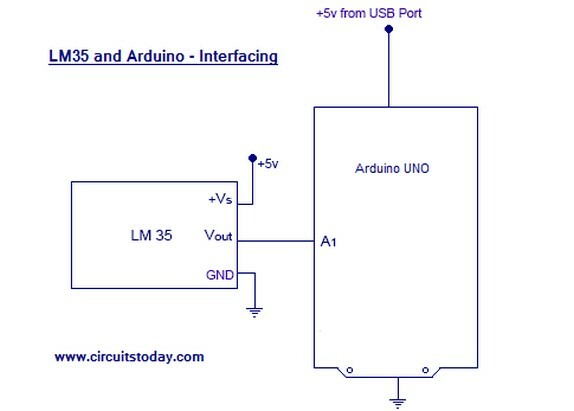 And one circuit for interfacing temperature sensor LM35 and Arduino UNO like in Figure 1 below. In here we will give you describe of Circuit Schematic Temperature Sensor LM35 and Arduino UNO Interfacing. And the last we will give you link to you to read more this circuit and description from original source. Circuit schematic like in Figure 1 above is Circuit Schematic Temperature Sensor LM35 and Arduino UNO Interfacing. According Circuitstoday site describe that LM35 is an analog, linear temperature sensor whose output voltage varies linearly with change in temperature. LM35 is three terminal linear temperature sensor from National semiconductors. It can measure temperature from-55 degree celsius to +150 degree celsius. The voltage output of the LM35 increases 10mV per degree Celsius rise in temperature. LM35 can be operated from a 5V supply and the stand by current is less than 60uA. The pin out of LM35 is shown in the figure below. So that’s all info you need about LM35 for this particular temperature display project using arduino uno. So lets get to LM35 temperature sensor interfacing with arduino!. And for more your information about Circuit Schematic Temperature Sensor LM35 and Arduino UNO Interfacing you can read it fully from original source using link here.